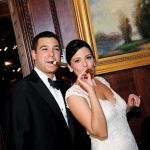 Jessica Bova & Joseph Macchione Jr.
Our love story began at a tiny Irish pub in Hackensack, New Jersey. I am a kindergarten teacher and Joey is an engineer. For our first date, he took me to a seafood restaurant in the area. He became my boyfriend shortly after. Two and a half years later, Joey and I planned to have a pizza night at our house. What I got instead was much better than pizza! When he got back from work, he immediately took out the ring, got down on one knee, and asked me to marry him. Our families were waiting for us at The New Bridge Inn to celebrate! When we walked into Nanina’s in the Park, our hearts skipped a beat. It was everything we ever dreamed of. 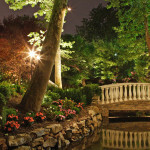 We fell in love with the romantic atmosphere, the beautiful gardens, and the incredibly compassionate staff. Tom Casella, the general manager, Peter Palmieri, a manager, Vicky Iandoli, our maître d’, and the entire staff went above and beyond for us to make our wedding day truly special. Every time Joey or I called or stopped by Nanina’s, Liz Simonski, the hostess, was there to greet us with a smiling face and helpful advice. We felt like we had known her for years. From the moment we arrived at Nanina’s on our wedding day, we were treated like royalty. Reverend Michael Savage married us in Nanina’s gorgeous gardens. Everyone was greeted at the cocktail hour with champagne and strawberries. Our guests were blown away by the amount of food and its presentation. We had butlered appetizers including buffalo shrimp, short ribs, mushroom risotto, and more. The food stations felt endless! We had everything from a wine and cheese bar to seafood stations to a mac-n-cheese station, a crêpe station, a barbecue station, and a martini bar with an ice sculpture. Our ballroom looked as if it was taken right out of a fairy tale. Our centerpieces were filled with white and green hydrangeas and ivory roses with splashes of deep coral and natural greens. Crystal candles and rose petals surrounded each centerpiece. We hung crystals and pearls from champagne flute glasses that gave the room a beautiful romantic feel. We offered a duet meal of chateaubriand and shrimp Nanina’s for dinner. Guests also had an option of chicken francaise or eggplant Napoleon. All the entrées were served with a skewered potato and bundled vegetables. We had the time of our lives dancing to The Infernos Band. Their energy and pure talent elevated our special day. From our entrance until our goodbye, guests were always on the dance floor! For dessert, we had a Venetian hour with an entire room filled with cannoli stations, pastries, chocolates, wedding cake, waffles, and anything else you could think of! Every guest left with a to-go cup of coffee and a bag full of zeppolis. In lieu of favors, we made a donation to the St. Jude’s Children Hospital in honor of our grandparents. We are incredibly blessed to have the most amazing family and friends in the world! Thank you to all our vendors, especially our photographer and cinematographer for capturing every beautiful moment of the night. Thank you to Tom, Peter, Vicky, Liz and all the staff at Nanina’s in the Park for making our dream wedding day come true. Thank you to our parents for their unconditional love, never-ending support, and guidance.